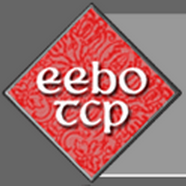 For those of you who were unaware, earlier this year Early English Books Online (EEBO) released thousands of documents in its Text Creation Partnership, Phase I (TCP-1). This makes hundreds of new Puritan documents available online, for free. A tremendous treasure chest of Puritan teaching indeed (Matthew 13:52)! Fourthly, hunger is humble, it is not choyce in its meate, if it cannot have pleasants and dainties, it will be con∣tent with Farmers food, yea any thing, Pigeons dung will be good food; so hee that truely desires grace, is of an humble heart, he can be content to welcome childrens crummes, and account it prefermentPage 11to sit with Christ his dogges: though with Pauls Widdow they wash the Saints feete; though with David they be doore-keepers in Gods house, yet so they may have grace, they care not though the whole world tram∣ple upon them, though they bee accounted the off-scowring of all things. Fourthly, hunger is humble, it is not choice in its meat, if it cannot have pleasants and dainties, it will be content with Farmers food, yea anything, Pigeons dung will be good food; so he that truly desires grace, is of an humble heart, he can be content to welcome childrens crumbs, and account it preferment to sit with Christ his dogs: though with Paul’s Widow they wash the Saints feet; though with David they be door-keepers in God’s house, yet so they may have grace, they care not though the whole world trample upon them, though they be accounted the off-scouring of all things. The result is obviously not perfect, but I believe it is much more readable. The process of converting these texts is time-consuming, yet worthwhile. Look for texts to be added continually and gradually to the Digital Puritan library in the coming months (and years). This entry was posted in Miscellanies by editor. Bookmark the permalink. Thanks for asking, Jason! With regard to the conversion of texts from EEBO, slow but steady progress is being made. The software we were using previously seems incompatible with Windows 10. So instead we have transferred our replacement text lists to MS Word, and we’re in the process of training a macro to conduct automatic search-and-replace based on the replacement text list (which currently has about 3,000 words). Every conversion is time-consuming, but the results are constantly getting better and better, and each subsequent conversion requires less “babysitting”. In the end I am confident it will be the best way to make EEBO texts more readable. In time we will likely begin converting those cleaned-up texts to epub and mobi files, so they can be read on tablets and e-readers easily. Please make “Mysterium & Medulla Bibliorum” by Francis Roberts available!!! That is one I have my eye on, for sure! The fall/winter edition of The Digital Puritan will include “The Great Worth of Scripture Knowledge” by Roberts.